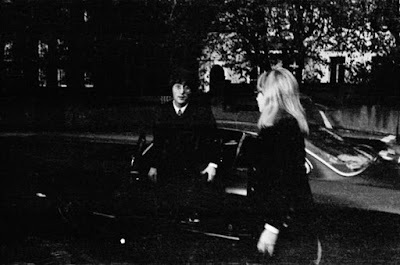 John and Cynthia arrive for Brian Epstein's memorial service. So I have a question. Are memorial services in England typically held long after the person has passed away? I understand that a memorial and a funeral at not the same thing, but all of the memorial services I have attended have occurred about a week or less after the person died. It seems like all of the memorial services in England that I have seen: Brian Epstein, Linda McCartney, George Martin, etc have been months after the person's death. Is there a reason for this? Hi Sara - a memorial service set for a later date is a fairly common practice, especially if you are expecting people from all over the world to attend. In the case of someone who is well known, like a political leader or someone of the Beatles stature in culture and entertainment, there will be guests with incredibly demanding schedules. A later date is set as courtesy to give people the opportunity to clear their calendars an attend the service. I hate to quibble, but I'm pretty sure this picture of George and Pattie is actually from the premier of How I Won The War. And other shots of them arriving at Brian Epstein's memorial service show them dressed more soberly than this. You're right, Mark, the George and Pattie shot is from How I Won the War premiere (the day after the Epstein memorial). The John and Cyn shot is them arriving at the memorial. You guys are all right. My files are a bit mixed up. MacGregor8--that makes a lot of sense. Of course my family members that passed away and had memorial services did not have fame or a need to wait for important people to clear their schedules. Thanks for the response.